The Theme is "WinterTime" and you have until 31st December to submit your entries. 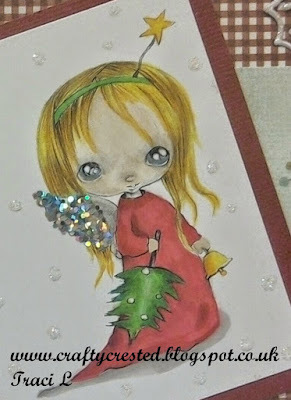 Thanks for sharing your gorgeous card with us at PFP this week, good luck in the draw. Thanks for entering our Christmas Card Challenge this week and good luck! What a sweetie she is..I LOve your colours, sparkle and all these pretty embellishments. Thank you so much for joining us this week at QKR Stampede. Absolutely adorable and precious! Thanks so much for sharing in our QKR Stampede Angel challenge this week! Sweet image and lovely card. Thank you for sharing with us at Crafting From the Heart. Beautifully coloured and a really cute card. Great card... love the sparkle!!! !Thank you for joining us at Craft your Passion this week!